It’s been 10 years since the first Twilight film. Here’s how to dress like its lead character today. Love it or hate it, you have to admit that the Twilight franchise is a true cultural phenomenon. It’s been 10 years (!!) since the first film was released and we’re still no closer to a winner in the battle of “Team Edward” vs. “Team Jacob”. But man candy aside, one thing we can agree on is that many of you seem to love the main character Bella Swan (played by Kristen Stewart) and her effortless style. 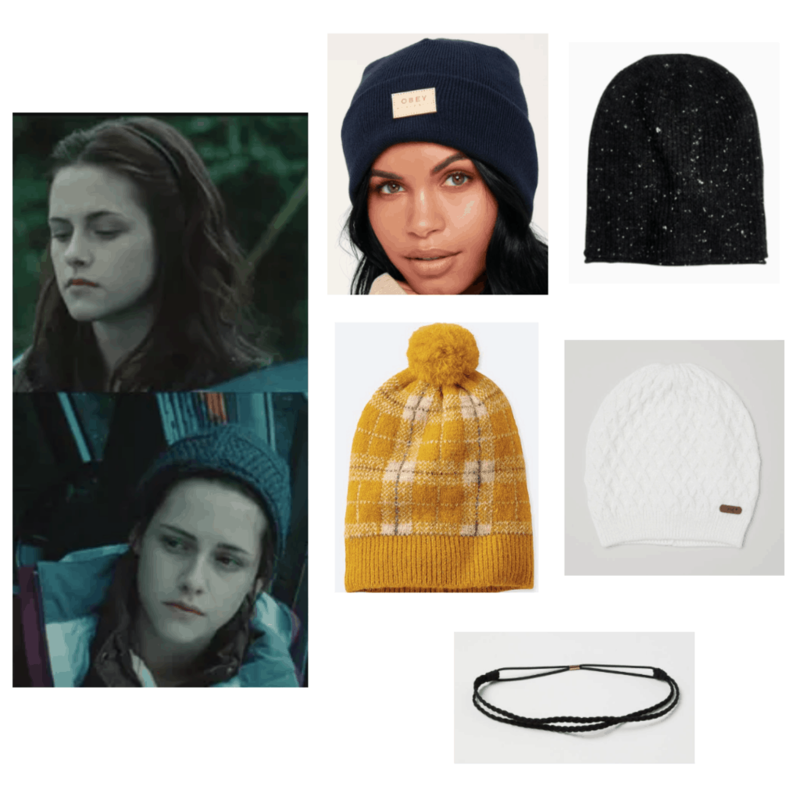 We first talked about Bella’s wardrobe back in 2009, so given the ten year anniversary of the film, we thought it was high time we post an updated guide to her style. 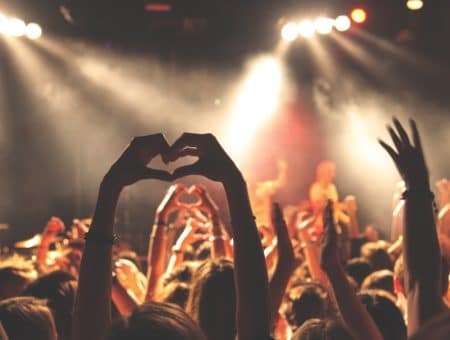 Read on to find out how you can dress like Bella today – you never know, maybe you too will capture the heart of a handsome but troubled teen vampire and/or werewolf. Bella’s style is very low-maintenance, yet she still looks gorgeous at all times. Everything has a pretty yet effortless “I just threw it on” look to it. While it is clear that Bella would much rather stare at Edward all day than spend hours getting ready (who can blame her), she does have a specific sense of style. Here we break down Bella’s wardrobe essentials, as well as show you two outfits that you could see Bella wearing on a typical day in Forks. 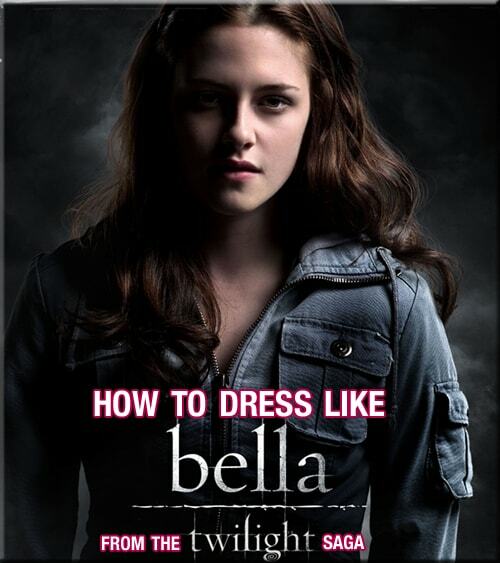 Bella’s wardrobe is very straightforward and simple. She has a wide array of long sleeve henleys and tops to shield her from the cold of Forks. Bella often sticks to neutrals and cool colors such as blues, greens and whites, but I mixed it up by adding a few colors such as red and electric blue. She’s also known to rock the typical Seattle button-down plaid shirt. When it comes to copying her style, the main thing that you should focus on is to make sure your top is laid-back. Casual tops are a Bella staple. Since Bella lives in a cold climate, she needs an abundance of coats to keep her from getting cold in dreary Forks. Unlike her tops, her coats have more variety in cut and color. Most of her coats end about hip height to show off her legs. Often, her coats are the most colorful part of her outfit, so she chooses them in colors like blue, yellow, red, and green. 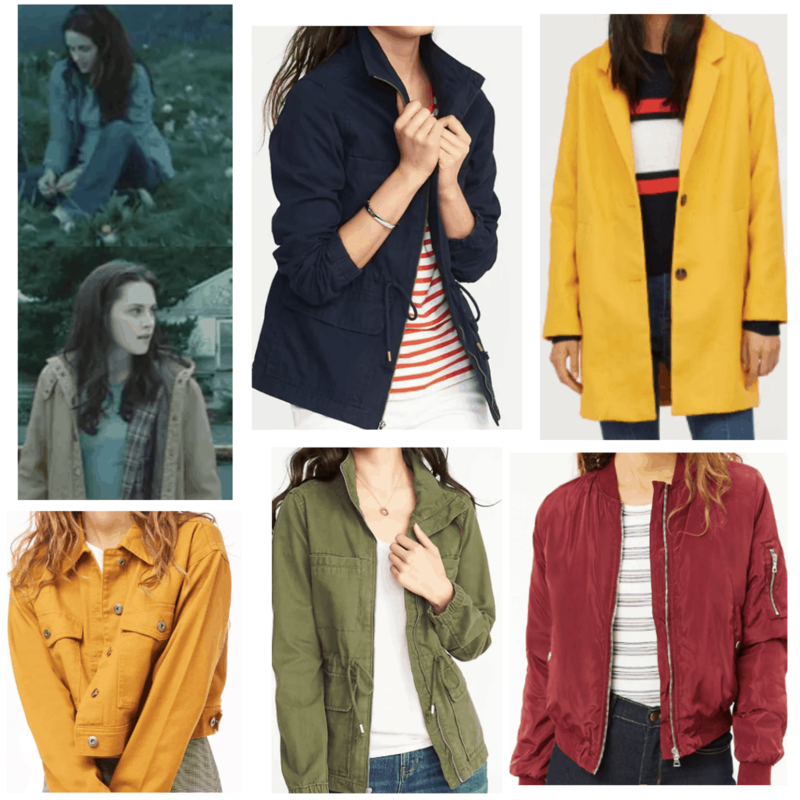 I love the red bomber jacket on the bottom right as an updated take on Bella’s look. As Bella grew up in Arizona, she has a bit of an All-American/Western style to her look and can often be seen wearing things like turquoise jewelry or suede boots. 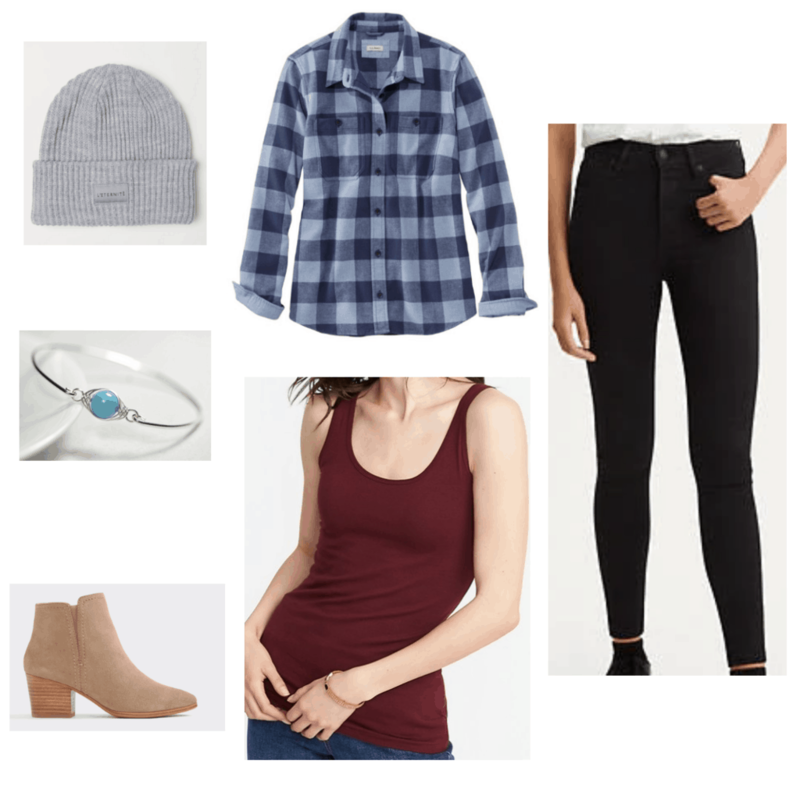 To copy her look, I chose a maroon tank top, a plaid shirt, and a trusty pair of denim jeans for a low-maintenance combo that’s very Washington state. To keep you from getting chilly in Forks weather, I chose a cute grey beanie to keep your head nice and toasty. Throw this outfit on and you’ll be ready to explore the forest with one of our dashing anti-heroes. For my second outfit, I chose pieces to show off Bella’s bohemian side. Her style often veers toward boho-chic, and this outfit reflects that, while still staying true to her low-maintenance mindset. 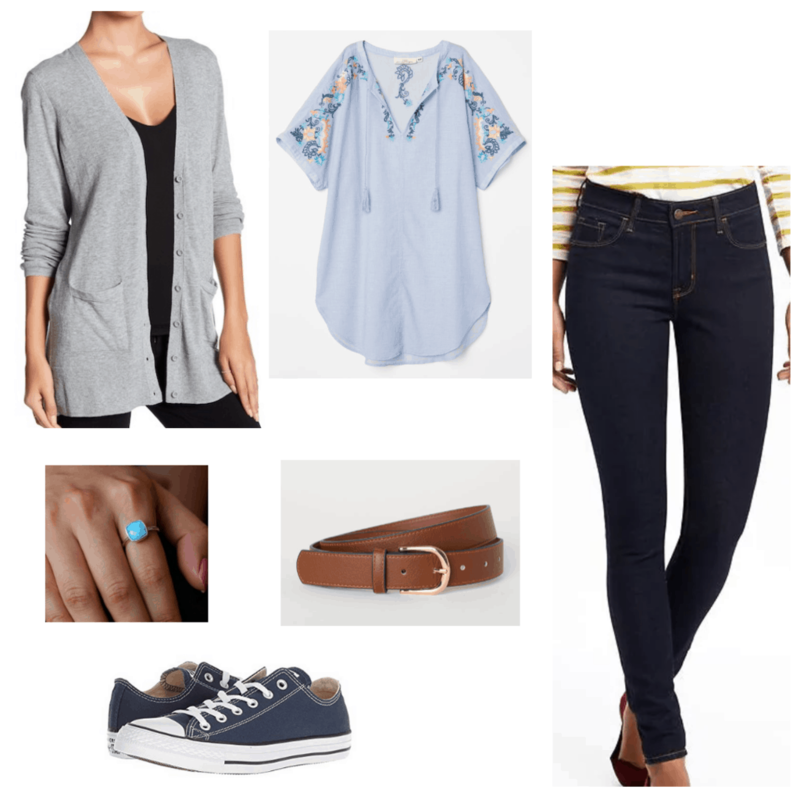 First, I chose a blue embroidered tunic and paired that with a gray cardigan. I then added dark wash jeans and a classic brown belt. For shoes, I chose Converse chucks in navy blue (Bella wears a similar pair in the films), and to add a touch of femininity, I picked out a delicate turquoise ring. Overall, this look is tough, yet when you examine the details, it’s also very feminine. This mix of tough and girly gives the outfit character. Bella’s hair is the stuff dreams are made of. Like Serena from Gossip Girl, she’s one of those girls that doesn’t know how lucky she is to have such a nice head of hair. All she has to do is roll out of bed and her hair is perfect. 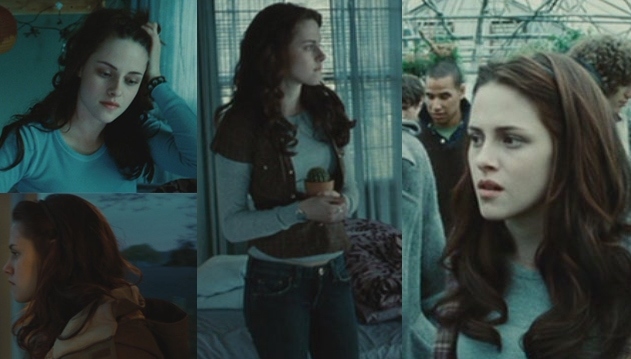 But don’t despair, you too can replicate Bella’s hair with the help of a trusty 1-inch curling iron. Separate your hair into sections and then grab a medium section of it and wrap it around the iron (don’t use the clamp). Hold the section around the wrapped area for about a minute and then let go. It should be a nice loose curl now. Continue doing this around the rest of your head (you don’t have to do all of it though, it’s nice to leave a few strands straight – it looks more natural), set your hair with a teeny bit of hairspray, and voila: you will have hair that no man (or vampire or werewolf) will be able to resist. As I mentioned before, Bella’s hair is pretty much perfect. Sometimes when she wears it down, she accessorizes with a thin headband on the crown of her head. You can try this style out to add a little bit of dainty detail to your look – all you need to do is push your hair back and place the headband in your hair. Also, headbands are fabulous because they’re so cheap. 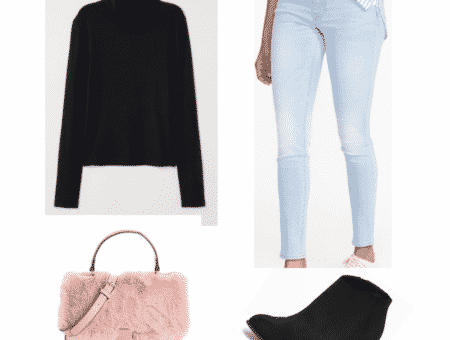 No matter your budget, this is one look you can definitely afford! Bella also wears the occasional beanie to keep her ears warm during those chilly days relaxing in La Push. I chose an assortment of beanies and berets in different colors to mix things up. They’re great because they add a pop of color to your outfit and also keep your head nice and toasty. What do you guys think of Bella’s style? Do you think I translated it well? Did you like this updated guide to her look? Whatever your thoughts, let me know in the comments! Editor’s note: This post was originally published in 2009; it was completely updated and revamped in 2018 by Sharon with new photos and information.